in all Universities/ Institutes of Uttar Pradesh State. 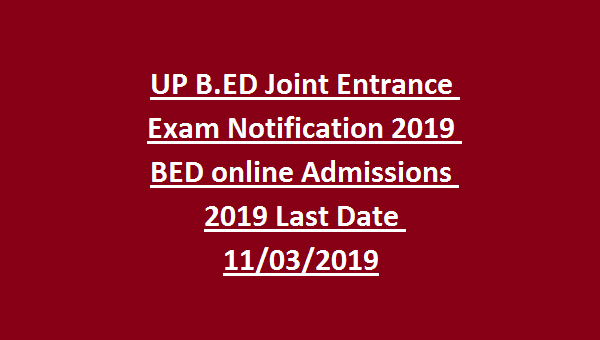 UP B.ED 2019 online registration starts from 11-02-2019. Interested/ Eligible candidates can register through online using the LKO University B.ED Admission Web Portal before closing date. Last date to submit application form is 11-March-2019. This Admission for B.ED Course in Uttar Pradesh Universities/ Colleges will be based on candidate performance in the UP B.ED Joint Entrance Examination, Which may be conducted on 11-04-2019 by the Admission Council. For more details like online Application procedure, Exam date & syllabus, Admit Card details regarding this Uttar Pradesh B.ED Entrance Test UP B.ED 2017 are mentioned below. Online application process starting date: 11-02-2019. Last date to submit online application form (without late fee): 11-03-2019. Last date to submit online application form (with late fee): 13-03-2019. UP B. ED Joint Entrance Examination Tentative date: 11-04-2019. Announcement of Result: May 2019. Applicants must have qualified Bachelor’s Degree with at least 50% marks (for B. Tech/ B.E students -55%) from any recognized University. For SC/ST/OBC/ PWD candidates marks will be 45%. For SC/ ST/ PH candidates is Rs. 1000/-. Uttar Pradesh B.ED Entrance Test will be conducted for 200 marks and consists of two papers (Paper I, Paper II). The time duration is 03 hrs. Two papers are in the form of multiple choice questions only. There will be no negative marking for wrong questions. Candidates applying for B. ED Admissions will be shortlisted based on UP B. ED Entrance Examination which will be conducted on 11-04-2019 (Tentative). Minimum Qualifying marks in the UP B.ED Entrance test will be 35% i.e. 53 out of 150. For SC/ ST/ OBC/ PWD candidates, minimum qualifying marks will be 30% i.e. 45 out of 150. The Admit Card will be uploaded soon on UPBED official web portal @http://digialm.com/. Candidates are advised to visit UPBED official website regularly to know the Exam centers and other updates. See the UPBED official notification for UP B.ED Entrance Examination Syllabus. UP B. Ed Results: After giving UP B. ED Examination, candidates are eager to know the results. UP B. ED answer key will be mailed or available at UPBED official website. Eligible/ Interested candidates submit their applications through online using Lucknow LKO University B. ED Admissions official website @ www.upbed.nic.in or https://www.digialm.com. Online application starts from 11-02-2019 to 11-03-2019 (without late fee). Last date to submit online applications with late fee is on or before 13-March-2019. 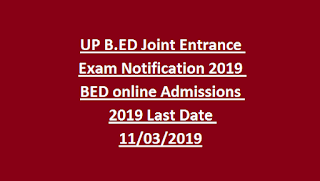 For more information regarding this UP B. Ed 2019 logging on to: www.upbed.nic.in.